Doug Barry is a Senior International Trade Specialist in the Trade Information Center, U.S. Commercial Service within the International Trade Administration. A record number of companies were recognized for their accomplishments in exporting at a White House ceremony this past May. Cleveland-based Jet Incorporated was represented by its chief executive officer Ron Swinko, who received the Presidential “E” Award. Swinko spoke with Doug Barry of the Trade Information Center, U.S. Commercial Service. Barry: Can you tell us how the company started and what it does? Swinko: The company was founded in 1955. The basic equipment the company designed at that time was to replace septic tanks with advanced technology, to treat the water using a smaller system and to allow the water to be discharged. Over the years, we expanded into commercial systems which are typically called small package plants for decentralized locations like small villages, hotels, resorts. That is the basis for our international growth as well. Barry: For the non-scientists, can you give us a quick overview of how things work? Swinko: It’s biological wastewater treatment. So anything that comes from either the sinks or the sanitary systems in a home or in a building that water enters into the system, into a tank where the solids are digested by aerobic bacteria. And part of our system is designed to inject air that promotes the growth of that aerobic bacteria. Barry: Tell us about the international part of your business. How did that start and what was the biggest challenge in getting going? Swinko: It started with inquiries because of the technology that was developed. The founder, David MacLaren, was certainly an innovator. And he was also very interested in expanding the technology internationally. He obtained a series of patents in several countries over the years. The most significant challenge was servicing our international distributors. And by servicing that means having enough inventory to meet their demands for immediate shipment, understanding what the export requirements are and ultimately providing solid responsive technical support for systems that have been installed globally. Barry: You do a lot of work in developing countries. Has that been a challenge? Swinko: Educating customers is a big challenge. Developing countries may be focused on environmental sustainability, even to a greater extent than we are here in the U.S., because of the scarcity of water. But they may not necessarily understand the benefit of regulation or the type of equipment that’s available. Over the last couple of years, one of our initiatives has been to educate regulators in, for example, the Cayman Islands and in Kenya. We hosted a seminar on wastewater management for the architects association of Kenya into at least provide some education about how wastewater treatment systems can generate water for reuse and how that can be incorporated into sustainable projects for apartment buildings and resorts. Barry: Who did you turn to in order to find a solution to that challenge? Swinko: We’ve used the U.S. Commercial Service quite extensively. 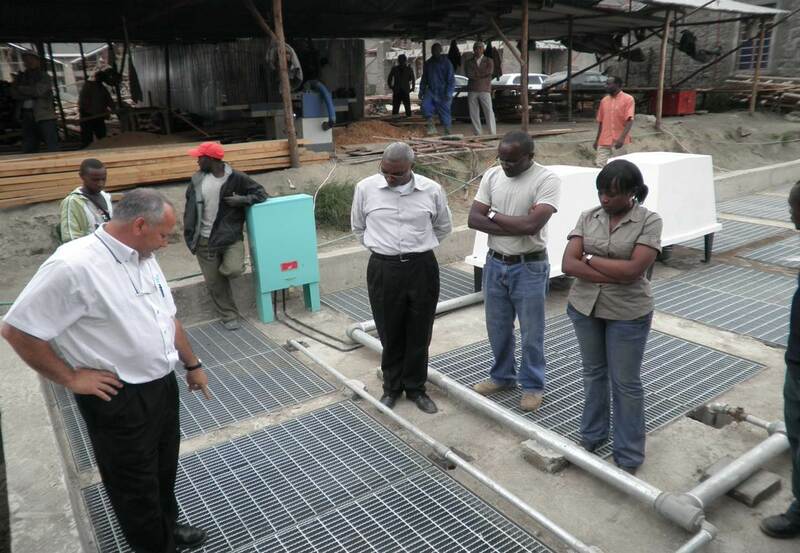 They have a wonderful service called the Gold Key, and because our business relies on increasing the number of distributors, we look for partners in developing countries who will act as distributors and who are technically capable either because they’re currently in the water purification business or because they’re in the construction business. We’ve used this service to expand into Southeast Asia and into South America. I just recently returned from a trade mission to Brazil that included four Gold Key meetings with potential distributors in Sao Paolo. Barry: When you say Gold Key, do you provide the gold and they provide the key? Swinko: It’s more mutual than that. But truthfully, the U.S. Commercial Service spends a great deal of time learning about our business, learning about and understanding our company and the requirements for distributors in the location, and then they evaluate potential distributor partners and partner companies in that area. They establish the Gold Key meetings after they’ve reviewed the capabilities and what our requirements are. Finally they look for a match, a good match I would say maybe in terms of company personality as well as technical expertise. Barry: Let’s talk about the matches in Brazil. It would have been hard for you to fly in unannounced to Rio and Sao Paolo and open a phonebook. So they had a solution for that. But how did it work out on the ground? Are you confident that good things will come of those meetings? Swinko: Very confident. Part of the service includes an interpreter. So if there are any language barriers, particularly with technical terms or equipment, the interpreters are very capable. But for the most part they also look for companies that have good language skills in terms of an understanding of English. We’re quite confident that this was an excellent trip for us. And we’ve had more detailed discussions with two of the companies and we’ve already had three quotes for systems requested. Barry: This was a U.S. Commerce Department trade mission? Swinko: Yes. The trade mission itself was a combined effort by the Commerce Department with the Brazil- U.S. Business Council and the U.S. Chamber of Commerce. It was particularly impressive in terms of the level of government officials that we met with and the management level of the potential customers or clients that we met. We received very detailed technical presentations on their environmental sustainability programs – and certainly from our perspective the mission was well worth the participation and the trip. Barry: Give us a snapshot of the company and its international growth. Swinko: We have about 30 employees. All of our manufacturing is done in our Cleveland, Ohio, location. The business in the U.S. is highly dependent on residential construction. So during the last several years, of course, the housing industry has struggled which would be putting it mildly. In fact, it’s been significantly challenged, and while we have done reasonably well domestically, internationally the expansion has allowed us to actually increase the number of employees and add an additional engineer so that we could continue to support the international business. Barry: What percentage of total revenues is international? Swinko: International is about 25 percent with some nice year-over-year growth in the 30-plus percent range. Barry: Where do you see it going in the future? Swinko: I would say certainly maintaining those particular increases especially because of the markets where we have a significant presence, like Africa, and as well as South American and Latin American countries. Barry: Are China and India on the horizon? Swinko: China, no – partly because of intellectual property concerns but also because we have such strong presence in these other developing countries where we haven’t fully leveraged the market. Barry: Explain the decision to do the manufacturing in the United States? Swinko: The foundation of the company was in Cleveland. So there is a strong commitment to manufacturing and assembling as much as we can in the U.S. Quite honestly, there are some very distinct challenges with that because certain manufacturing processes and products are not available in the U.S. or if they are, they’re available at a high price compared to what you can purchase overseas. We do also try to work in Mexico to keep the supply chain as short as we can. Barry: Is there a value in “Made in America” with your international customers? Swinko: Without a doubt, especially in the environmental technologies equipment market. They greatly respect the regulation that we’ve had over the years that’s improved our air and water. And made in America or imported from America in many of these countries has a very strong, positive connotation to the equipment. Barry: Can it make up for the premium pricing that is required? Swinko: In many cases it can. In particular they do also evaluate whether and how many of your components may have been made outside of the U.S.
Barry: Would you say that you are a better company as the result of your international experience? Swinko: I would say we’re certainly a better company, and we’re a better company because each of those countries, while they can use the basic equipment, do require some modification, and do require particular levels of service. So it’s really driven some of our innovation of the equipment systems.